A lot of recently released shooters have boasted “verticality,” transforming the genre’s once level landscape into a multi-tiered jungle gym of violence, but Namco Bandai’s upcoming Inversion hopes to do one better by turning off the gravity. 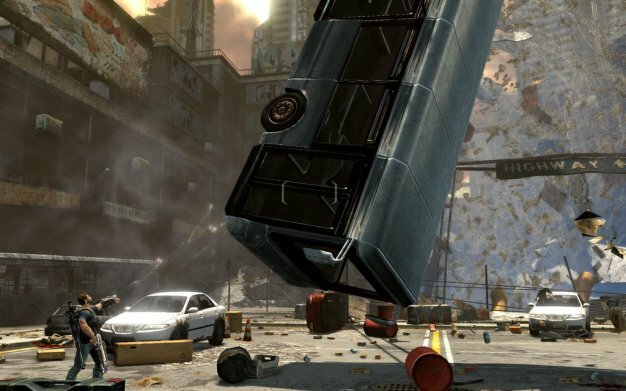 Developed by Saber Interactive, the third-person shooter should hit the Xbox 360 and PlayStation 3 in 2010, at which point players will assume the role of a cop scouring the alien-infested, gravity-defying rubble of his home town in search of his missing son. According to the press release, the earth has been invaded by the Lutadore, a technologically advanced alien race whose gravity-controlling weapons have caused random areas of the city to enter zero gravity or suffer vector changes. Through this disorienting topsy-turvy nightmare, 28-year old police officer Davis Russel is trying to find his son, aided by his neighbor Lou Delgado. The Cloverfield-light story doesn’t sound all that exciting, but the gameplay, featuring all sorts of futuristic gravity manipulating weapons and a Havok-powered destructible cover system, sounds very exciting. Players will use weapons like the Grappler to create adaptable cover, flush out enemies, or solve environmental puzzles. I’m putting all my hopes and dreams for a videogame version of Labyrinth’s Escher-inspired castle into Inversion‘s basket.